Time once again for The Online Genealogist to dip into his bag of garba- er, TRICKS and bring you the “best” and “funniest” items you will ever “see”! Gotta love the quotes; no disclaimer required! 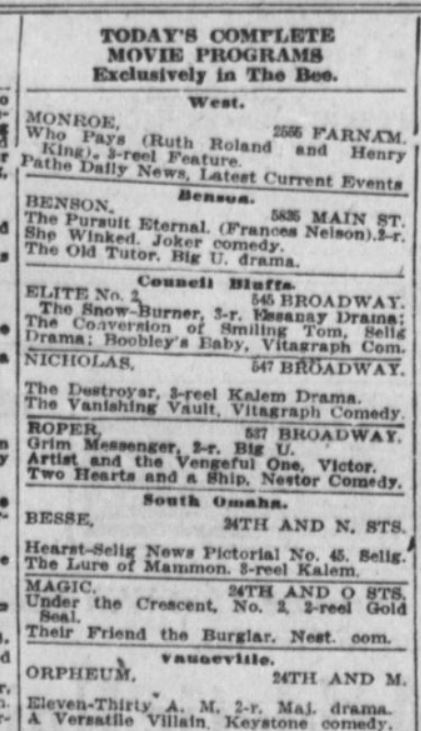 For you newbie readers of this garba- er, BLOG, that would be any family history-related tidbit found in print, such as newspapers and city directories. But mostly, newspapers and city directories. Most anything that fits into the “Ya just can’t make this up and if you did; why would you want to?” category. Two Churches married by a Rev. Bell… in a church! Ah, yes – a Lively death. They’re a hit a parties! Zzzzzzz. Besides the splotchy print, what is wrong with this marriage announcement? Fortunately, it was corrected the next day. …after a lengthy tongue-lashing from the furious bride, I’m sure! Many confusing introductions at THAT reception. Ya think?? Is this a marriage or chess commentary?!? Of course, BISHOP-KNIGHT would’ve been funnier. Though maybe not for Miss Owatta Knight. …marrying the girl that sat behind you in school! What’s worse than two families flipping out, worrying about the upcoming marriage? …having to go through that hell, times two!! Jeez, the McFarlands and Ashfields took up so much room that last newlyweds Arnold and Amaret were left with SQUAT! Not looking for Lois and Clark; but super, man. Staying in Lebanon, but this coming from the Granite State Free Press. See comment below barber Pat… above. 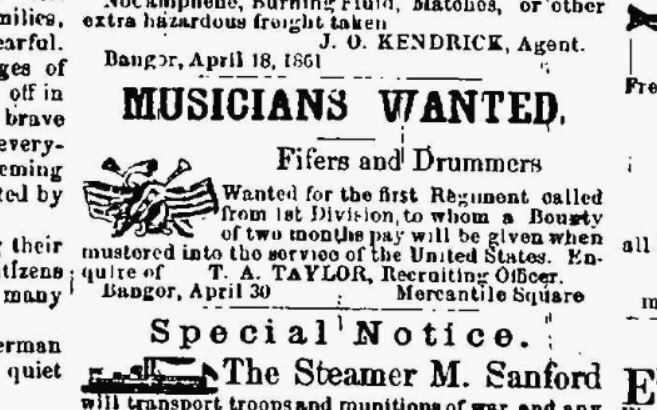 It’s May 18, 1861 and this Bangor Daily Whig ad says Uncle Sam is NOT looking for soldiers to sign up for the barely-started Civil War. “You’ll never see combat! Only fifes and/or drums! !” Yeah, riiiiiiiiiiiiight. Oh, today’s e-editors have NO idea. Even so, sounds better than his colleague Dr. Farr; a mechanical dentist. I can hear the machinery nearing a patient’s mouth now. Oh, the screams. 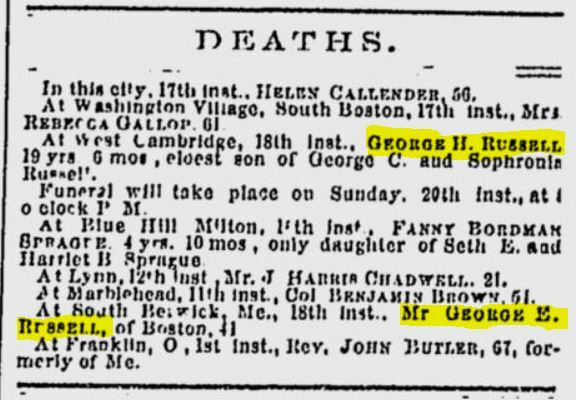 And the July 19, 1856 issue of the Boston Transcript shows that it was NOT a good day to be a George Russell in New England. And so ends this Ancestry.com-free blog posting!!! No, I’m not aiming towards an Ancestry.com mutiny with this recent run of posts; it just so happens that they’re so HUGE and have SO much going on! And as I will point out, it’s a double-edged sword. Ahhh, yes. This is the genealogical equivalent to a debate on religion or politics. There are some strong opinions out there, for sure. Foreshadow, foreshadow… And check out the pages and pages of comments! Which I will read AFTER this post. I fully agree with Ancestry Anne’s answer… to a point. You just knew that was coming, eh? If you’re the number one genealogical website, shouldn’t there be some types of *gasp* standards set for the massive amount of Public Member Trees (PMTs) they host under their Ancestry.com name? I can’t go merrily updating James Brown‘s Wikipedia page claiming that he has risen from the dead and will be appearing for a limited engagement at Bellagio’s poorly-named O Theater in Vegas. Wikipedia won’t allow me to do that! Why do we use Wikipedia? Because, overall, it is the most reliable encyclopedia of EVERYTHING; because they have standards. Why doesn’t Ancestry.com have the same mentality when it comes to their PMTs? Huh, Anne?? But who should I be: Fantomex or Shard? Hmmmmmmmm… Yes, some would suggest Bird-Brain – heh. OK, a show of hands… How many of you clicked on one of the three hyperlinks, bringing you to their Wiki page? Come on, admit it – when you did see it was Wikipedia, was there an immediate sense of relief because you KNEW that the information on their website was probably 99.999999% accurate? Now, if you tried to post erroneous info on Wolverine‘s Wiki page, rabid fans would be looking for a bounty on your head! But what if the X-Men links led to a “legitimate” Ancestry.com Public Member Tree? Would your confidence level for Ancestry be comparable to that of Wikipedia’s; or more towards their “leftover” .000001%? Did Anne’s watered-down quasi-excuse address any of these issues? Heck, no! It’s Ancestry’s 800-pound pink hot potato in the room. Huh?!? “Since we can’t control how accurate our PMT info is, we’ll wash our hands of it and say ‘You’re on your own!'”. Think you’d see anything like that from Wikipedia? Granted, many Ancestry Public Member Trees are fantastic; wonderfully documented timelines with viewable source images included for all to see. But those are the exceptions and not the rule. Tell me again, why isn’t ANY kind of proof a requirement to add a “fact”? Have the PMT “lunatics” taken over the “asylum”? I feel as if I’m beating a dead horse, as I know this has been a major bone-of-contention for long-time Ancestry subscribers. Most of who would’ve never included so many bad clichés in one blog post. Then again, maybe we DO need to yell our heads off so the PMT Dept. can hear us! 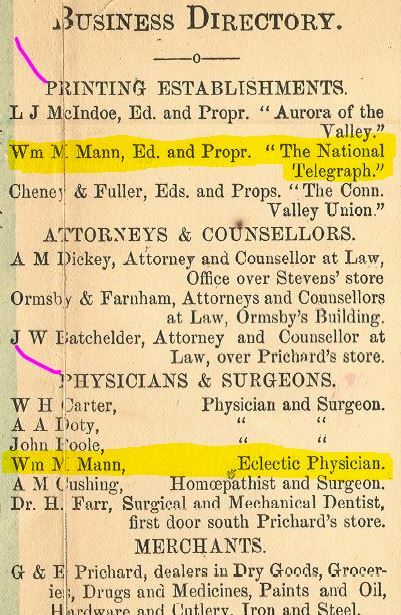 So, Ancestry Anne – if there’s even such a person – did you have to bite your tongue… uhhhhhh, bite your FINGERS, while replying to “Vicki”? Ancestry – you expect the gazillion documents in your collection to be accurate and reliable; why not the similar high-quality standards for your PMTs? I know of several members who have brought this issue to your attention with specific examples, yet to see no resolution. And, no, I refuse to play the New Membership Trumps Public Member Tree Accuracy card. Doesn’t even need to go there. Or did I just inadvertently use it by saying I wasn’t going to?? So, again – Anne’s advice is sound and should be heeded, but with the above added caveat lector, emptor, venditor and a bunch of other Latin words. Jeez, I’d be completely lost without the internet. Time for Ancestry.com to roll out their new PMTs slogan?… “Don’t fully trust our Public Member Trees; just use them like really good hints!” OK, so it could use a bit of tweakage. Now to spend a few hours reading this post’s 127 comments accumulated over the past 12 days… I’m surely not the only one to bring up these issues. And here’s hoping you never receive a shaky leaf for your newest “relative”, Fantomex!